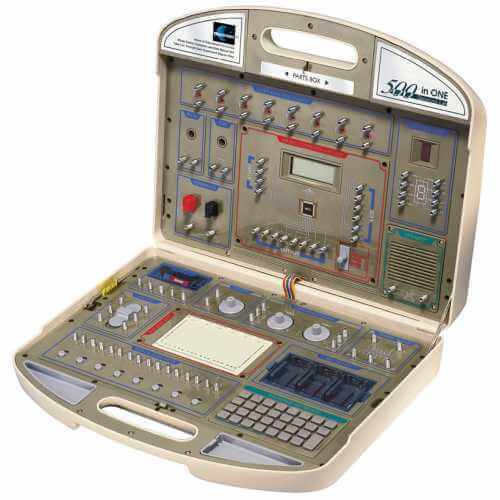 The 500 in 1 Electronic Project Lab is the top of the range and contains all the parts and instructions to assemble 500 educational and fun experiments and circuits. It is used by many educational establishments and offer tremendous value for money at only 40 pence per experiment! The main difference between the 500 in 1 Electronic Project Lab and the 300 in 1 electronic lab is the addition of the Advanced Hardware Course and a microprocessor based Software Programming Course. Ideal for any inquisitive mind aged 14+ years and over. Suitable for schools and other educational establishments as a practical and cost effective teaching aid for long-term repeated use. Presentation Box Dimensions: 48cmx 38cm x 12cm (19" x 15" x 5") approx. Includes a built-in speaker, LED digital display, integrated circuits, rotary controls transistors, transformers, diodes, resistors, capacitors, LEDs, phototransistors, CdS, earphone and lots of other components. A built-in breadboard allows easy wiring and connection of components. The 100 software programming experiments provide you with a good understanding of the concepts behind computer microprocessors and programming. The course is based around a 4-bit microprocessor with 4 inputs, 8 outputs, 5 registers and 64 RAM storage. A 32 button keyboard is used for entering commands to the microcomputer and an 8-digit LCD Display indicates information entered and output while the experiments process. The command set comprises 26 instructions (IN, OUT, MOV, ADD, SUB, ROR, ROL, INC, DEC, JMP, JZ, JNZ, JC, JNC, CMP, BON, BOF, TM1, TM2, STP, NOP, SEC, CLC, HEX). Build you own knowledge by exploring amplifiers, analogue and digital circuits plus learn how to read schematic diagrams. Build a special lighting effects, radio transmitter and receivers, amazing electronic sound effects, cool games and MORE! These three books gives detailed step-by-step project instructions and are a course in electronics in themselves! They take you from basic component theory, through analogue and digital hardware circuits and right through to learning software programming.